Since 1950, the company has introduced many brands in a wide range of industries and sectors. We will continue to support our legacy brands including Maxi-Joint, Flex-Valve, and SoundZorber. 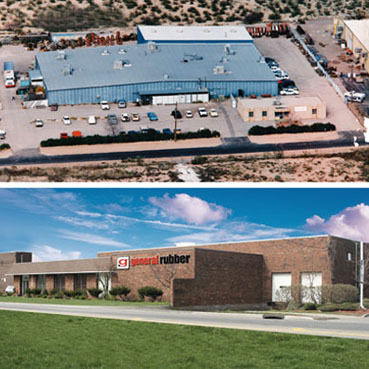 General Rubber’s rich history of application-based solutions and project experience has earned us a place as an industry leader and product innovator. We have created case studies to communicate our extensive capabilities across multiple industries and sectors. Quality examples include our studies on developing 12-foot-diameter dismantling expansion joints for the world’s largest common cooling water system (Ras Laffan, Qatar), and developing an all-rubber in-line pressure-balanced expansion joint, used within newly constructed AP1000 nuclear plants (VC Summer 2,3 / Vogtle 3,4). The Project Table here represents our experience across many industries and sectors, and includes links to the aforementioned case studies. We are committed to keeping our customers informed regarding our products and services as well as company news and events. We embrace social and traditional media outlets as a means for improved communication. Find and follow us on LinkedIn, Google+, Twitter and YouTube, contact us to subscribe to our weekly newsletter and be sure to bookmark and visit our News & Events Page.